We’d love your help. Let us know what’s wrong with this preview of Mindshadow by J.M. Dillard. To ask other readers questions about Mindshadow, please sign up. Better than usual for Star Trek Expanded Universe fare. This is a decent enough Star Trek novel. The story could have been a TV episode. A bit slow in the beginning, but the plot is fairly interesting and the characters are well done. Once again I wasn't sure I was going to enjoy this story and I was surprised that I finished it in one day. It isn't often that I can read a book in a twenty-four hour period. While I was upset that Spock was hurt so madly and seemed to not be getting any better I held out hope that he would finally recover and become the Spock we all love so much. There is a lot going on in this book and I was somewhat disappointed that it took Spock recovering his memory so the others would figure out what is g Once again I wasn't sure I was going to enjoy this story and I was surprised that I finished it in one day. It isn't often that I can read a book in a twenty-four hour period. While I was upset that Spock was hurt so madly and seemed to not be getting any better I held out hope that he would finally recover and become the Spock we all love so much. There is a lot going on in this book and I was somewhat disappointed that it took Spock recovering his memory so the others would figure out what is going on with the planet Aritani. I figured it out right away and the crew of the Enterprise are the best and brightest of Starfleet. I mean really. I think that the author could have done a little better with that whole plot device. As a kid, I was a big fan of J.M. Dillard's movie tie-ins, especially the ones she did for STAR TREK VI and THE FUGITIVE. But this was my first time to see her put together an original story. When it comes to giving fans exactly what they expect from a TREK novel, MINDSHADOW ticks all the boxes. Like much of the early TREK fiction written by female authors, we again have a beautiful and highly capable new crewmember who comes aboard and initiates a love triangle with Kirk and another officer befo As a kid, I was a big fan of J.M. Dillard's movie tie-ins, especially the ones she did for STAR TREK VI and THE FUGITIVE. But this was my first time to see her put together an original story. 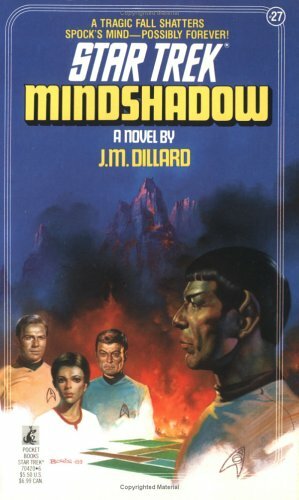 When it comes to giving fans exactly what they expect from a TREK novel, MINDSHADOW ticks all the boxes. Like much of the early TREK fiction written by female authors, we again have a beautiful and highly capable new crewmember who comes aboard and initiates a love triangle with Kirk and another officer before eventually exiting the saga as the result of semi-tragic circumstances, never to be heard from again. Critically brain damaged after a failed mission on the planet Aritani, Spock must return to Vulcan to recover. Kirk and his crew must struggle to peacefully resolve the political fallout of the disaster while Spock strives to recover the memories of the fateful day which left him brutalized. Dillard's novel feels right, in that the character actions and interactions appear to have been lifted straight from the screen. Mindshadow is a mostly-predictable mashup of a couple TOS episodes, with a poorly-executed twist at the end. It starts off very promisingly...but eventually, there is just too much plot, and too many machinations happening in such a short book. The result is a number of headaches following who is double-bluffing who, and a sub-plot of Vulcan with a possible love interest for Spock that isn't as successful or convincing as it could have been. That said, the command of the Original Series crew has always been Ms. Dillard's strength, and it carries this novel efficiently to its conclusion. Mediocre genre fiction. If not for the cast of characters, would be unreadable. But, about these Radun race? Is there precedent for these guys? Are they really related to Klingons? another reread. I liked parts of it, but I was picking holes in it all the way through. Keen psychological insight and deep characterization make this Trek novel a thought provoking piece of literature.